Young Money: After years of underperformance, are value stocks worth buying? After years of underperformance, are value stocks worth buying? This is partly because "the 12 month forward price-to-earnings ratio of growth stocks has risen by 55% compared to only 11% for value stocks" and because "growth stocks, unlike value, have a greater proportion of their cash flows occurring in the distant future... This makes them akin to long-duration assets, which are more sensitive to changes in long-term rates. As a result, growth stocks have benefited far more than value stocks from rates falling to record lows." Markowicz summarizes his message by stating that "the valuation picture seems fairly supportive of value’s relative return prospects." While the article makes a lot of thought-provoking points and is worth reading, I disagree with its conclusion. I don't want to say that value is doomed to continue underperforming growth, but I don't think buying value stocks is a good trade ex ante, for several reasons. My main disagreement with the article relates to how it defines value. It calculates value's performance relative to growth by comparing a basket of stocks with the lowest price-to-book ratios (the value stocks) to a basket of stocks with the highest P/B ratios (the growth stocks). This means that the actual valuation of value stocks will vary significantly with the market's overall valuation and the dispersion of P/B multiples. So today's value stocks may be radically different from the value stocks of yesteryear, making value's historical outperformance potentially less meaningful than it appears. I think it is less meaningful: despite their long underperformance, value stocks are noticeably more expansive than they were the last time value was out of favor. In 2000, when the technology bubble peaked, many "old economy" stocks had fallen 25-50% over the prior 18 months and were trading at low P/E ratios. For instance, Autozone and Sherwin-Williams traded at 10-11x earnings despite growing their earnings per share steadily for years. Some companies with more mundane financial results traded at even lower prices, e.g. Universal (UVV) and Ball Corp (BLL) traded at 5x earnings in March 2000. Maybe I'm not looking hard enough, but I don't see anything like that today. Most companies with steady EPS growth are trading at or above the market's P/E multiple, and the ones trading at single-digit P/Es tend to be cheap for good reason: the business is cyclical, they're failing retailers, they were part of a leveraged buyout and carry a huge debt load, etc. By buying stocks cheaply, value investors try to create a "margin of safety"--they hope that even if the underlying business disappoints, they'll avoid losing money because the price they're paying for the stock discounts a lot of potential bad news. In my opinion, absolute valuation is what creates a margin of safety, not relative valuation or relative performance. If investors buy a stock at a discount to its net working capital, they won't suffer crippling losses even if the company has to liquidate. If they buy a stock at 5x earnings, they'll earn back their investment in five years, freeing them from the need to make assumptions about the distant future. Obviously, that's an oversimplification: companies that trade below their net-net value occasionally incur large operating losses, and companies that trade at low P/Es can squander the E on ill-advised acquisitions. But in general, buying absolutely cheap stocks is both safe and rewarding in a way that relative-value investing isn't. Energy stocks provide a good test of absolute versus relative valuation. After the price of oil collapsed in 2014-15, many energy bulls made relative-value arguments: energy stocks had become an unprecedentedly small part of the Standard & Poor's 500 index, their underperformance vs. the index had reached extreme levels, etc. At the same time, most energy stocks weren't particularly cheap when valued individually: the ones that had earnings traded at high P/Es and would trade at high P/Es even assuming oil rebounded. Many were also poorly managed and prioritized production growth over shareholder return. Ultimately the relative-value arguments didn't matter: energy stocks kept falling until the oil price bottomed, and since then they've barely kept pace with oil futures despite their significant financial and operational leverage to higher oil prices. This influence works in a couple of ways. One is the dynamic that Markowicz mentions, in which growth stocks tend to be longer-duration while value stocks tend to be shorter-duration. Another is that value stocks, as measured by price to book, disproportionately belong to the financial sector. Since banks borrow short and lend long, i.e. they typically borrow money through overnight deposits or short-term certificates of deposit and make multi-year loans, the shape of the yield curve affects their profitability. All else being equal, banks should earn higher profits when the yield curve is steeper. 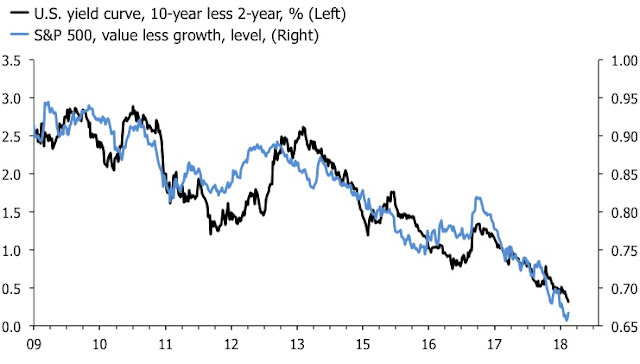 So long as the European and Japanese central banks practice ZIRP and financial repression, I doubt the US yield curve will steepen dramatically. When foreign institutional investors buy US bonds, they often finance the bonds by borrowing dollars on a rolling three-month basis. This hedges their currency risk. If the US curve steepens while the European and Japanese curves stay relatively flat, longer-term US debt financed with short-term USD borrowing becomes more attractive to foreign investors, and any movement they make into US debt should re-flatten the curve. This doesn't mean interest rates--and by extension bank profitability and value stocks--can't rise, but it makes a sustained rally less likely. I believe that the preponderance of banks among value stocks has also affected value's relative performance in another, more obscure way. Banks have two unique risks that don't affect other industries. One, they depend on the trust of their depositors and lenders and can quickly fail if they lose that trust. Two, regulators can force them to issue new equity during a crisis or at the bottom of an economic cycle, diluting shareholders at the worst possible time. These risks hit many banks in 2007-09. E.g. Washington Mutual failed, and Citigroup had to massively dilute its shareholders to survive. Despite rising 600% from its 2009 low, Citigroup shares are still 87% off their 2007 high. I believe that value's underperformance since the financial crisis is partly a byproduct of these risks hitting banks. Bank stocks declined during the crisis, failure and dilution made the decline permanent, and this has depressed the rolling ten-year returns for value stocks. This dynamic isn't supportive of mean reversion. If a bank underperforms the broad market because it had to take a "hard reset" by issuing new equity at the bottom, that doesn't imply it will subsequently outperform. To be fair, the article touches upon this, but it's something that I would have emphasized more. The article also mentions that the value's underperformance vs. growth shrinks when the value and growth indices are adjusted to reduce the financial and technology sectors' respective weightings. • I think the stock market is more competitive than ever before and that this will suppress returns for many styles of investing including value. Academic research into "investing factors" has increased interest in statistical-value strategies, and the proliferation of hedge funds means that cheap small- and micro-cap stocks that institutional investors traditionally ignored are no longer ignored and are less likely to stay cheap. Don't assume that value will outperform growth in the future just because it typically has. • Good relative performance doesn't guarantee good absolute performance. Value stocks could outperform growth stocks while actually falling, for instance if glamour stocks like Facebook, Amazon, Netflix, and Google fell 25-30% during a correction while value stocks fell 10-15%. It discusses the role of sector weightings in value and growth indices. It also mentions that the outperformance of value stocks has traditionally been far stronger among small-cap stocks. Since hedge funds skew toward smaller stocks, I think it's likely that much of the historical value premium has been arbitraged away.